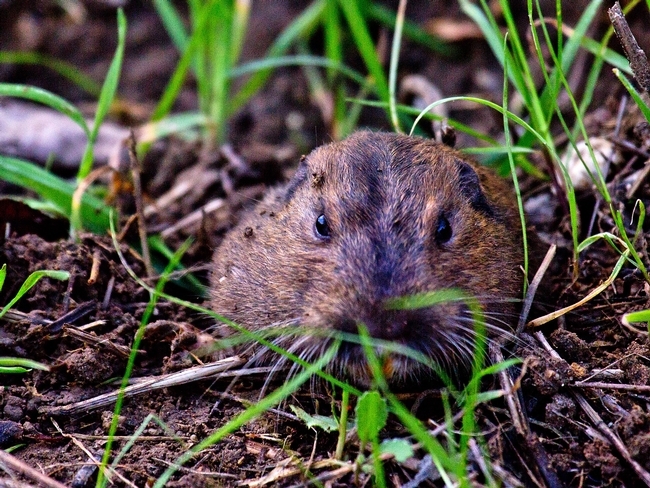 Pocket gophers, more commonly known as gophers, are one of the most common vertebrate pests found in school and community gardens. They are known for their extensive burrow system through the soil and also for the damage that they can cause to plants in gardens. Gophers are also known to chew on irrigation systems. They are responsible for soil erosion since they move soil to the surface when they construct their burrow systems. Their tunneling can damage turf and the mounds they leave behind can be tripping hazards. 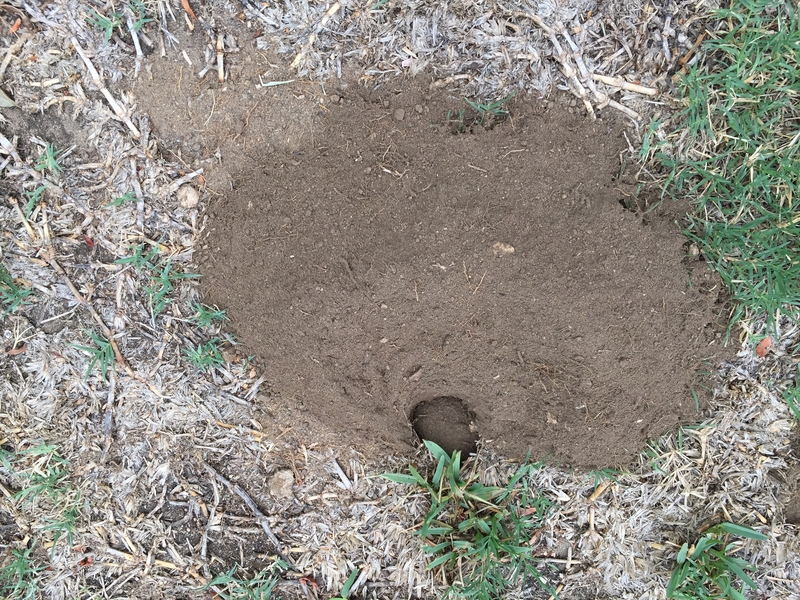 Pocket gophers are rarely seen above ground but sometimes you can see them popping out of a feeding hole. They are small mammals with small eyes and ears and have fur lined cheek pouches (pockets) for storing food. Pocket gophers are considered nongame wildlife, which means that they can be managed by any legal means. In school and community gardens there are many options. Trapping is one of the easiest ways to curtail a gopher issue in a school or community garden. It is really important to monitor the issue and insure that the problem does not get out of hand since gophers are very prolific breeders and are easier to manage when there are less of them. There are many trap options for trapping gophers. It is important to consider public safety when using these tools. Traps are often very tightly sprung and could damage fingers and toes of anybody that unexpectedly steps in a set trap. While research has shown that it is not necessary to cover over your trap sets and close them up, it is important to reduce the risk of exposure to a trap, especially in a school setting. It is recommended that trap sets in this scenario should be covered and inaccessible to youth. There are some toxicants that are available to unlicensed professionals for use on gophers. The most commonly available products are those containing zinc phosphide. These products are applied below the ground and therefore risk of exposure is very low. Bait shyness can be associated with this active ingredient so it is important to monitor the issue and ensure that it is being reduced. Otherwise, you may be applying rodenticide that is not being consumed. Fumigation is a common and often successful way to manage gophers. However, many of these products are considered Restricted Use Pesticides and can only be applied by a licensed professional. Products like gas or smoke cartridges are not considered effective for the management of gophers. Gophers can be excluded from school and community gardens but the costs of installing underground fencing can be cost prohibitive. Instead, consider excluding gophers from smaller areas like raised beds. Remember that gophers can travel above ground too, so if you install wire fencing with a ¾ inch mesh, be sure to extend it above the ground also. Wire baskets can also be used to exclude gophers from the root systems of high value trees and shrubs. You must take care to ensure that these baskets do not restrict the growth of the roots. For more information on gophers and other vertebrate pest, please visit the UC IPM Pest Notes.